I’m a polenta newbie. The first time I even had it was this past summer in Paris, served alongside a beautiful roast pork tenderloin at the lovely little wine bar and bistro Les Papilles. At first Asheley and I thought we were eating unbelievably smooth, buttery mashed potatoes with some sort of flavor twist. And then it dawned on me… this must be polenta! And my eyes were opened. Glorious, creamy, decadent polenta. Where have you been all my life? Fast forward eight months later, life got in the way, and I forgot all about how I so wanted to start making polenta. Until now. The short ribs that were slowly braising in the oven cried out to me. polenta. Polenta! 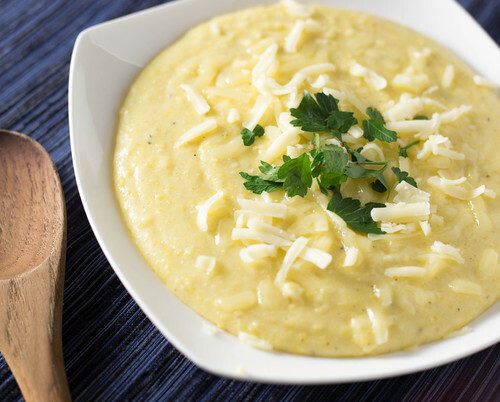 Creamy, cheesy, decadent polenta. Being new to the tradition of polenta cookery, I investigated recipes and scoured the internet for tips. Then, it was experiment time. Some went well. Some not so much. And a couple disasters along the way. First, what’s up with this… many recipes call for using dried polenta, which to me looked identical to corn meal. Polenta is typically more expensive, so can’t I just use corn meal? Is this just a marketing ploy to get buyers to spend more money? Apparently the line between corn meal and polenta has blurred over the years. Typically, when you buy something labeled as “polenta” nowadays, it’s basically just medium-grain corn meal. 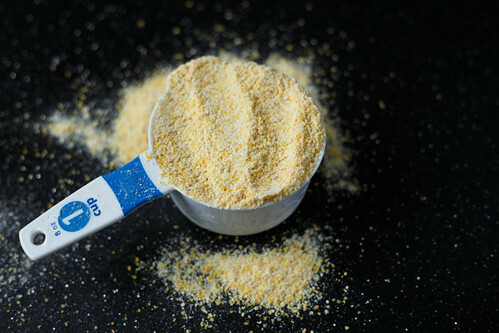 You can find corn meal, on the other hand, in a variety of grind sizes, such as fine, medium, or coarse. Sometimes you will also see that polenta has been degerminated, while corn meal typically still has the germ of the corn kernel still intact. So go ahead, just use cornmeal for your polenta. Most recipes do recommend using the medium grind size. Personally, through my couple adventures in amateur polenta cooking, I’ve come to enjoy a mix of fine and medium ground corn meal. All by itself, cooked corn meal is kind of ehhhh. Actually, a lot ehhhh. It’s completely bland. That’s where our two buddies butter and cheese come in. Most recipes call for parmesan cheese, which I actually haven’t tried yet. I probably should. Asheley loves goat cheese, so we tried that, but didn’t really love it. Maybe we needed to add more goat cheese. We’ll revisit that option eventually I’m sure. But then my friend Tyler suggested good ole’ sharp cheddar, which ended up being the clear winner. It added that big cheesy kick I was looking for. There are a couple different cooking methods out there. Low and slow on the stovetop with constant stirring is traditional, but I wanted a quicker, easier way. I came across a no-stir oven method, which was met with decent success. It calls for stirring 1 cup of corn meal, 4 cups of water, 2 tablespoons of butter, and some salt and pepper all together in an oven-safe skillet and cooking for 40 minutes in a 350°F oven. Stir and then cook for 10 more minutes. Remove from oven, add cheese, and serve. Ridiculously easy, no fuss. But did it work? Well, yes. But I found 2 problems. First, the polenta wasn’t as creamy and decadent as I was hoping for. And second… this is kind of embarrassing, but both Asheley and I burned our hands on the handle of the skillet. I know, it’s our own stupidity. We are both so used to having skillets only on the stove top, so when we went to stir in the cheese, we both touched the handle and burned our hand. I guess we need to learn to wrap a kitchen towel around the handle of out-of-the-oven skillets to avoid future kitchen accidents! 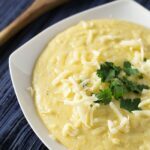 Then I saw this easy recipe in the New York Times by Mark Bittman, and he claimed that you can achieve creamy stovetop polenta in 15-20 minutes. I tried it. I adapted it. I’m sold. Polenta should be at a bare simmer, and cook for 15 minutes, stirring occasionally. If the mixture gets too thick (mine did), add water, 1/2 cup at a time. I ended up doing this twice. 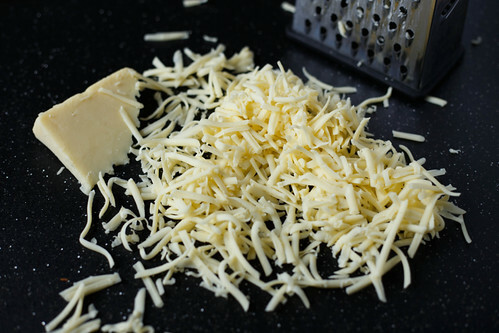 Remove from heat, stir in butter and olive oil, and then stir in cheddar cheese. Season with Kosher salt and freshly ground black pepper.